Office theme for Winstep Xtreme/Nexus/Nexus Ultimate. 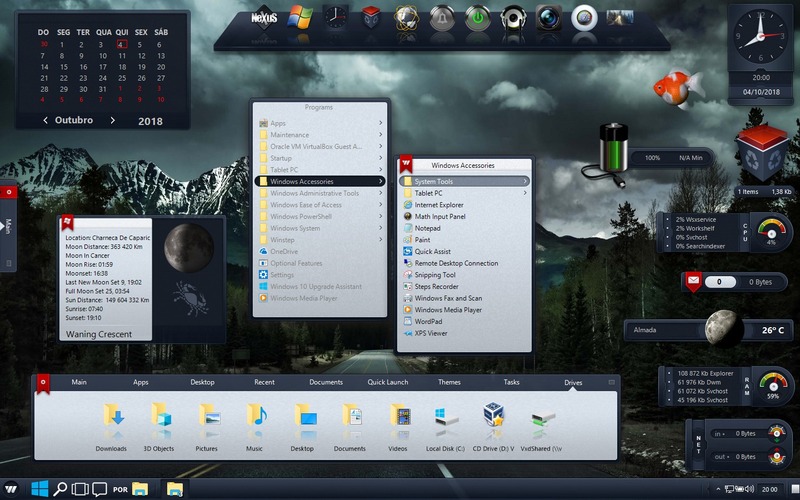 Original theme by Danillo, brought to you by Winstep Software Technologies/WebGizmos. Battery, Moon and Calendar desktop modules by Mindy43. IMPORTANT: Requires v18.3 or higher of Winstep Xtreme or Nexus Ultimate. Hope you like this theme, been sitting here (incomplete) on my hard drive for years, so I decided to finish and upload it now. Unfortunately the newer desktop modules (calendar, battery monitor and moon phase) are not skinned, so if anyone would like to skin them properly (Mindy, etc...) please just let me know. EDIT: One thing I forgot to mention: the little taskbar 'handle' at the far right of the taskbar, in v18.8 it shows up as a small 16x16 square, as it can be seen in the screenshot. This has been corrected in the next release so the handle extends over the entire taskbar height as it should. I'm liking it. My Calendar does not skiun though. Read the first comment, you blind bat. will the windowblind itlself be uploaded also? There's no matching WindowBlind's skin - this is an original Winstep theme. Perhaps someone would like to make a WB skin out of it: as I said in the screenshot's thread that would be perfectly ok with me, and I can even provide the original PSD file if they want it. I'd like to take a stab at making a Windowblinds for it Jorge. I'd like to take a stab at making a Windowblinds for it Jorge. Great looking Winstep BTW. Thanks, Don. You got mail. When I saw this I said gimme. Got me an office and I didn't even have to pay rent. Thank you Jorge. I have a lot of Winstep skins. To my knowledge, the calendar has never been skinned. Jorge, if I could get the PSD, I wouldn't mind doing some skins to match, like DesktopX, rainlendar, etc. Sure. Send me an email to Winstep support. I have your email, but you don't have mine? Tsk..tsk. Bah. I was just being too lazy to look it up. Can't say how much I like this theme. Thank you so very much for sharing. Very nice skin.